Before my 3x great-grandparents Boudewijn and Johanna Remynse DeKorn immigrated to the United States, they had three children, Geertruit (1848), Dirk or Richard (1851), and Maria or Mary (1855). Then a fourth child, Adriana (Jennie), was born in 1859 in the United States (Ottawa, Michigan). Sadly, little Geertruit passed away before she was nine months old–and before the other children were born. 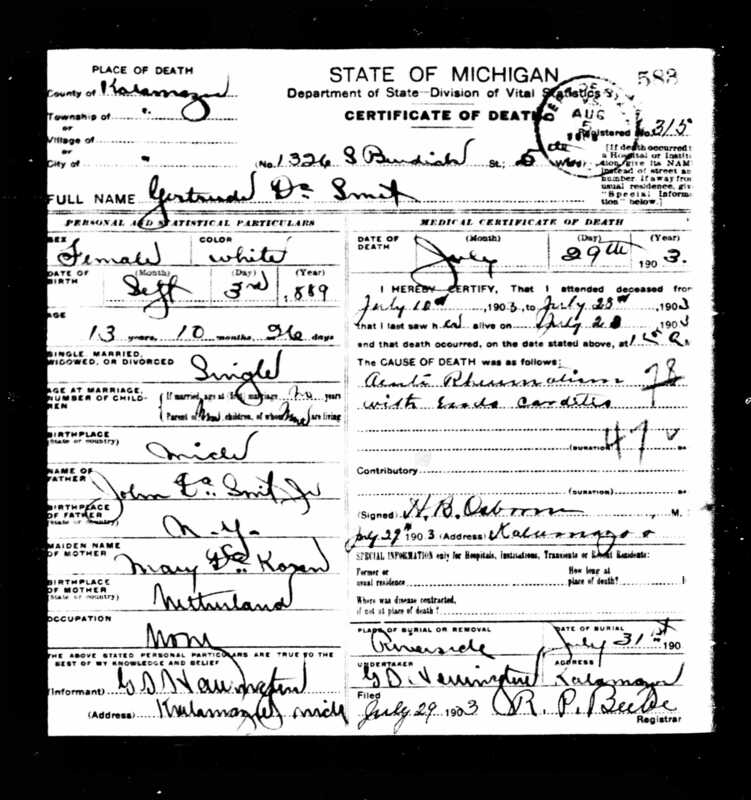 This is the record of her death–second entry on the left side. As with most of the European records of this time period, there is no mention of the cause of death. It’s perhaps particularly sad that the first child that my great-great-great grandparents had passed away. They wouldn’t have known that they would have three healthy children who would live long lives and have their own children. This will be my last post until September. I am taking off the month of August. I hope to catch up a little on my research (and my sleep). See you in a month! For the first time (OK, maybe not the first), I bit off more than I could chew. The DeSmit family has been very time-consuming, and there were more children and grandchildren than I originally bargained for. Therefore, this post is going to literally just scratch the surface. I’ve gone through the children of John DeSmit, Jr., and Mary DeKorn DeSmit previously, and I was careful to focus on baptism records, photos, and headstones. In this post, I am sharing what I know about John Jr’s half-siblings (children of John Sr and Jacoba Lamper) and their spouses and children. The further I dug my shovel into the past, the more children popped up. It got to the point with the second batch (Francis DeSmit and her husband Renier Van Delester) that I saw that this is a big job, and that I shouldn’t be spending much more time on it (this group is not related to me as the John DeSmit, Jr. family is). I’m sorry to say I have too much other unfinished business (er, branches) to attend to, so I present to you very preliminary and flawed findings on this group of DeSmits. I’m sorry if I have missed individuals, but it is very likely that I have. This is my most fleshed out group. I was aided by a DeSmit family researcher, Timothy Morris. On 4 November 1858, Adrian was born. Now be careful if you are researching Adrian DeSmit. There are many Adrian DeSmits who have lived in Kalamazoo–many who were even related to this Adrian. Our Adrian here is the son of John Sr. and Jacoba. So be sure. It gets VERY confusing! Adrian lived until 25 March 1938 when he died in Banks Township in Antrim County, Michigan. But during his lifetime, he married more than one woman. In 1885, Adrian married Anna Versluis. Photos of Adrian and Anna can be found here. The couple had one daughter, Cora Mary DeSmit on 4 October 1888. I could not find Cora’s birth or baptism record. A descendant could order the birth record from Kalamazoo County. This is one of Grandpa’s photos. Adrian’s daughter Cora DeSmit married Bert Reno Nyland (1885-1941). Although it doesn’t sound like it, Bert’s family was Dutch-American, also. This beautiful photo of Cora and Bert was shared with me by Timothy Morris who colored it for his family tree. When Anna died in 1916, Adrian was left alone, but four years later, on 8 April 1920, Adrian married his son-in-law Bert’s widowed mother, Alice Zeedijk Nyland (born 1859 in the Netherlands and died on 14 June 1937 in Kalamazoo). Note that she died about 10 months before Adrian did–on Adrian’s death certificate his spouse is indicated as Anna Versluis–there wasn’t room for more than one name and they went with his first wife). Cora and Bert ended up having six children that lived to adulthood and beyond. Their first child, John, died at birth of “prolonged labor.” Bert died on 2 May 1941 of a stroke. They were in living in Banks, Michigan. That must be why Adrian died there in 1938–perhaps he was living with his daughter and son-in-law after Alice’s death. Here is a more casual photograph of four generations: Adrian DeSmit, Cora (DeSmit) Nyland, Howard Nyland (one of Cora and Bert’s children), Joyce Nyland (4 months old). Joyce was born in 1935. Cora passed away 1 November 1953 and her headstone is found at Riverside Cemetery. The cause of death for Frances is heart-breaking. Ovariectomy with resulting shock. It could have been something as simple as a harmless cyst on her ovary that resulted in surgery that led to her death. At first, I thought that the couple had two sons born in Kalamazoo. Renier was born 3 September 1883. Jan was born 6 July 1885. But then I discovered children, William, born 18 February 1888 and died October 1957, and Cora, born 4 March 1890. She passed away in 1982. It is possible that Francis, or Frank, was born around 1896, but all the other Francis research led to someone else. Renier Jr. (who went also by Rine) married Johanna W. Dunning (1883-1957) on 9 September 1908. Their son Francis was born about 1910, and there seems to be a lot of documentation out there about him. If a brother Francis of Renier Jr. existed (born about 1896), he has been confused by this nephew (who, I believe, served in WWII). Rine passed away 4 December 1958. The next son, Jan, came to be known as John. Here is his baptism. Note that the original spelling of his father’s name was probably Reinier Van de Luister. He lived in [Hammond] Indiana with wife Clara and children John (b 1914) and Leona (b 1917). Clara, born 17 December 1889 and died on 12 July 1966, is buried at Elmwood Cemetery in Hammond, Indiana. William, born 18 February 1888 and died October 1957, married Etta Florence Dunning on 28 July 1915. They had at least one child, Mary Louise, born about 1925. According to the marriage record, William was a farmer. I saw that William is buried at Mountain Home Cemetery in Kalamazoo, so I requested a photo of his headstone. I did the same for his wife, Etta. Within a few hours, my Findagrave volunteer hero Jeff had responded with a link to the shared headstone (photo was taken by another volunteer). Only daughter Cora was born 4 March 1890. On 4 September 1948, in Kalamazoo, she married Orie A. Curtiss. Note that she was 58 and he was 48. Needless to say, they had no children. Orie was born 9 August 1900 in Cleveland, Ohio. He died in Galesburg, Michigan, on 12 December 1985. 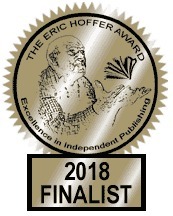 When Orie was 20 he was a teamster in the ice industry in Flint, Michigan. In the 1953 city directory, Orie was a “Hd Loader” in Kalamazoo. What do you think that means? He was married before, in 1937, to Eliza V. Smith in Indiana. She was also almost 10 years older than Orie (Orrin?). I doubt they had children since she was already 46 when they married. But the question is: did Cora, Orie, or Eliza have children from earlier marriages? Obviously this is a very complicated history that would take a lot of work to rebuild. You can see from the headstone that the Curtiss’ grew old together. On 23 April 1866, Elizabeth was born. She married Jacob Hycoop (born abt 1865 in the Netherlands), and they had at least 2 daughters, Mamie (born 1889) and Cora (born 1892). Elizabeth lived until 18 May 1946. In fact, in one of the newspaper articles I’ve posted, it was her yard where John, Sr., hoed the celery on his birthday. Mamie married Rene Bowers. They had at least one son, John. Daughter Cora married Herbert Brink (1890-1947). 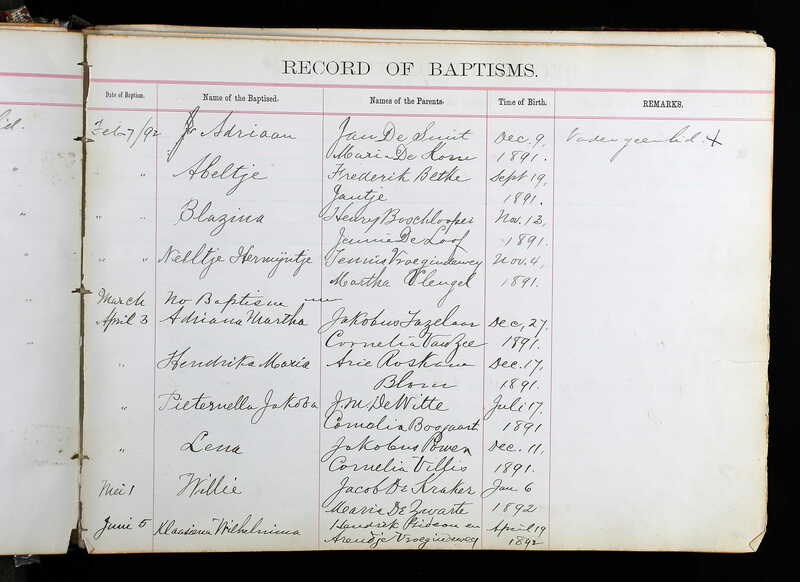 I found a baptismal record for a daughter, Helen Elizabeth, for 20 April 1930. Helen was born 5 November 1930. Haha, that does not make sense. So am I reading this document incorrectly? Cora died on 14 May 1986. Finally, Martin was born 17 November 1870, and grew up to marry Adriana Schiereck. They had a son called Clarence Wynoble, so it is probable that Clarence was Martin’s stepson. Martin died 6 November 1942 in Plainwell, Michigan. You can see that my research has been whatever has been the easiest pickens. There is no rhyme or reason here on what I am showcasing. This family needs a good year spent on it. But I hope I’ve given a headstart and that any one or more branches can be picked up and followed and filled in with more and more facts. If you have DeSmit photos you wish to share, I might like to post them on this blog, so please email them to me. Is that John DeSmit Jr. in the Newspaper? I’ll try to finish up John DeSmit Sr.’s other grandchildren next week. Pioneer Cemetery turned out to be a bust, though, for his first wife Jennie, as well as for two of the babies of John and Jacoba that passed away. There are not too many places they could have been buried in those early days if the cemetery was in the City of Kalamazoo. There are other cemeteries in areas around Kalamazoo, but not in the city. I might be too stubborn, but I can’t imagine them using a cemetery that wasn’t in town when they lived next to downtown. This week I wanted to share a newspaper article from Joel Reeves. I have photos of Mary DeKorn DeSmit, but I had never seen a photo of her husband, John DeSmit, Jr. But here he is in the newspaper! The photo is from 1915, although the article is from 1981. The boy in the photo, Edwin Reeves, is John’s grandson. I love seeing actual work with the celery that Kalamazoo was known for. What a fabulous photo. Notice that written on it says that the Model A capacity was 750 pounds loaded with 150 lb of celery. According to the writing, that put the weight at over 1,125 pounds! I hope too many heavy people didn’t get into those Model As at one time . . . .
John DeSmit, Sr., had one child with his first wife, Jennie, and the rest with his second wife, Jacoba. I have only scraped the surface of researching the DeSmit family, especially this generation of John Sr’s children. So much more can be done. I will not be doing it; however, if you are related to the DeSmits and need help researching your own branch more in-depth, please contact me, and I will be happy to give you ideas of where and how to search. I am also happy to help if you would like to write more about the family for posting on this blog. I’d also like to mention some stellar sleuthing on the part of Joel Reeves. He discovered that Riverside Cemetery, the cemetery of choice by the DeSmits (and also of my great grandparents, etc.) did not open until 1862. When Jennie DeSmit died in 1854 or 1855, she must have been buried some place. Here are some articles that Joel discovered about the possible site of her grave. I feel that the first article gives one big clue about the site of Jennie’s grave. This Pioneer Cemetery that is in the articles was in existence until Riverside opened. It was “bulldozed” later for a park. But the very last person buried at Pioneer was Rev. H. G. Klyn, who was the second pastor of First Reformed Church. I feel it’s very likely that the family belonged to First Reformed Church. This relates to two of John and Jacoba’s children, too. The first Adriaan and the first Francena died as infants in 1856 and 1857. They were possiby also buried in Pioneer Cemetery. Today’s post will cover the children of John Sr.’s first born son, the son of first wife Jennie. The other children will be in next week’s post. My great-great-grandfather’s sister, Maria Catharina “Mary” DeKorn, married John DeSmit, Jr., and they had far more children than any of John’s siblings. Their first child, Janna (Jennie) DeSmit, was born 7 March 1873 in Richland, which is in Kalamazoo County, Michigan. She was baptized 3 August 1873 at First Reformed Church in Kalamazoo. (Oh, do I wish I could see a photo of that church in those days). 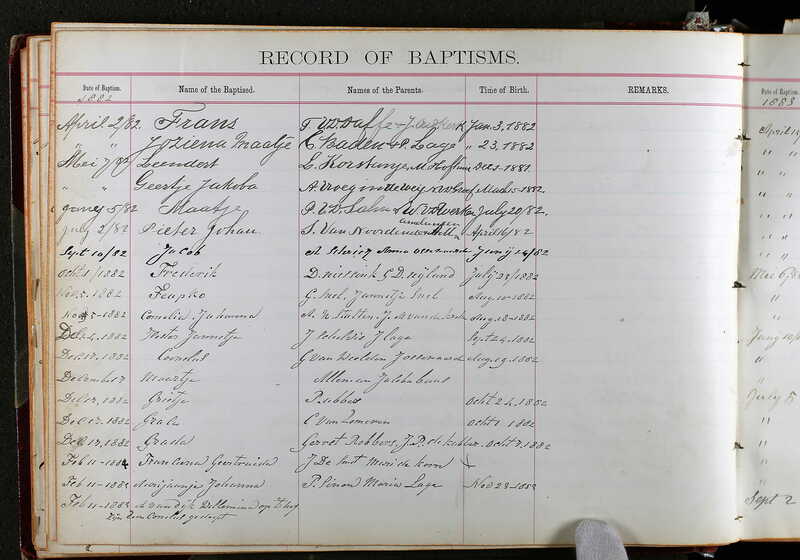 Notice what it says about her father on the baptism record. Keep in mind I don’t know her father’s baptism information. On 14 June 1905, Jennie married Abraham Grofoert (1873-1926) in Kalamazoo. Unfortunately, Jennie passed away three years later, on 14 June 1908 in Kalamazoo. She was buried at Riverside Cemetery on 17 June 1908. This was only one month after her uncle, Richard DeKorn’s, wife Alice passed away on 5 May 1908. Here is Jennie’s death certificate. The spelling on Jennie’s headstone (and that of her husband was Grofvert). The next child was Boudewyn (Benjamin) De Smit, named for Mary’s father, my 3x great-grandfather. He was born 10 February 1875 and baptized 4 April 1875 in Kalamazoo at First Reformed Church. 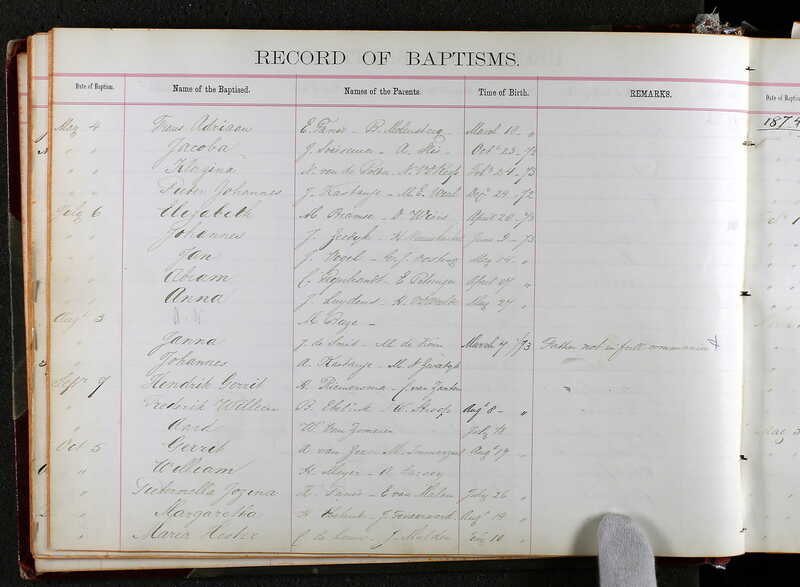 His father was “off the hook” for this baptism record. Ben was a mason like his father and grandfather before him. He had brown hair and blue eyes, according to his WWI draft registration. The year after his older sister died, Ben married Jennie Alphreta White (1869-1930) on 5 July 1999 in Grand Rapids, Michigan. Their son, Benny DeSmit, was born 10 December 1909 in Kalamazoo. Wow, that was a short pregnancy. Jennie passed away on 10 December 1930 in Kalamazoo at age 55. Ben died on 28 April 1958 in Mattawan, which is in Van Buren County, Michigan. He was buried on May 1 at Riverside Cemetery in Kalamazoo. I do not have his death certificate. Next up was Jan or John DeSmit III. He was born on 16 July 1877 in Kalamazoo. John, with brown hair and blue eyes, was a brick layer like his brother, father, and grandfather. On 20 July 1899 he married Pieternella Paulina (Nellie) Schrier (1879-1900) in Kalamazoo. You can see their wedding invitation with questions that arose in this post What About the DeSmits? Their daughter Nellie D. DeSmit was born on 30 April 1900 in Kalamazoo. Sadly, John’s wife Nellie died 10 days later, on 9 May 1900. I had more answers to this story of John and Nellie in the post Another Mystery Solved. John married again, on 15 December 1926 in Goshen, Elkhart, Indiana. His wife was Grietje (Margaret) Riepma (1873-1933). Margaret died on 31 July 1933 in Kalamazoo. John died in April 1964 and was buried at Riverside Cemetery on 30 April 1964. I do not have his death certificate either. 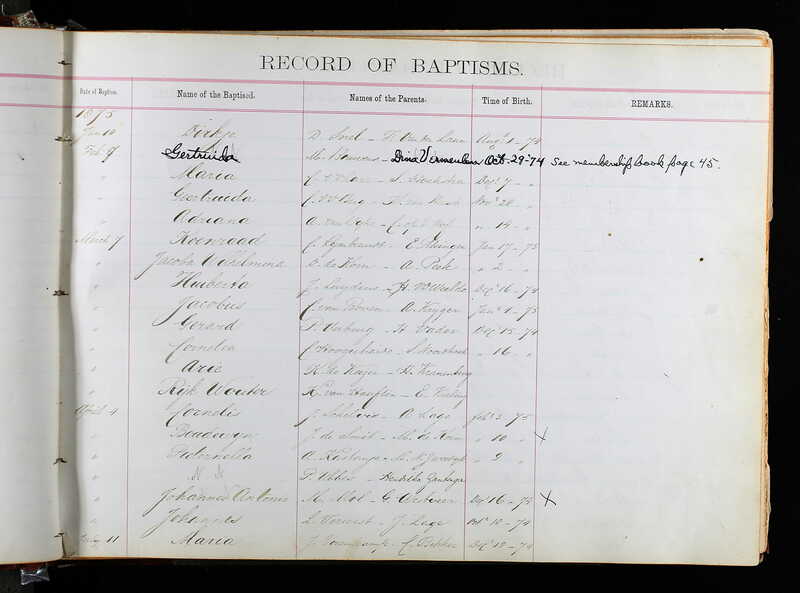 I have not found the baptism record for John. I would be willing to bet that I own photographs of one or more of the older boys of John Jr.; however, they are not marked (sadly). UPDATE: As it happens, I just received a beautiful photo of John DeSmit III. The year might be 1955, and he is with three of Edwin Reeves’ cute-as-a-bug’s-ear grandchildren. The next DeSmit child was Jacoba, known as Cora. She was born on 12 October 1880 and baptized on 6 February 1881 in Kalamazoo. On 7 June 1899, Cora married Charles Howard Pierce (1877-1971) in Kalamazoo. Their daughter, Eleanor Ruth Pierce was born on 2 September 1907 in Kalamazoo. Cora passed away on 26 July 1954. She was buried at Riverside Cemetery on July 29. After Cora, Franciena Geertruida, or Frances Gertrude, was born on 22 November 1882 in Kalamazoo. 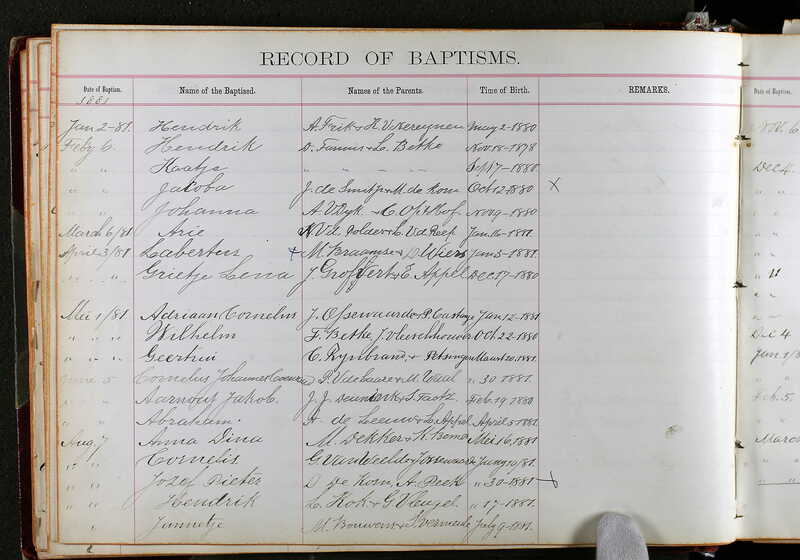 She was baptized 11 February 1884 at First Reformed Church. This was a longer time period before her baptism, but since the baptisms were done in clusters, she could have been ill and had to wait for the next time the baptisms were performed. On 26 November 1902, Frances married Charles Reeves (1876-1938). Their son, Edwin R. Reeves, was born on 19 March 1904. (DOD 1978). In 1911, the couple divorced, and on 17 September 1914, Frances married Jacob Flipse Jr. (1868-1940), who was forty-six years old and had been married to Frances’ Aunt Christina DeSmit who had passed away without leaving any living children. On 29 May 1916, the couples’ son Richard Jacob Flipse (DOD 2001) was born. His father, Frances’ husband, was 47. He waited a long time to have a son! On 11 August 1940, Jacob passed away. Frances’ older son, Edwin, passed away in Pasco, Florida, on 28 May 1978. Right around that time is when I met her at her home. Here is a photo of her from Joel Reeves from the 1970s. Four years later, Frances passed away at age 96 on 15 January 1980 in Kalamazoo. She was still living in the Burdick and Balch neighborhood as of the time I met her in the late 1970s. She was buried on 18 January 1980 at Riverside Cemetery. I put in a request for a photo of her headstone, and less than ten minutes later I got an email letting me know it had been accomplished! I have to give a shout out to Findagrave volunteer Jeff Phillips who then went on to make sure all branches of the DeSmit family in that section were photographed and loaded onto Findagrave! Jeff is a real credit to Findagrave! The next DeSmit child lived to adulthood, but died quite young. Dirk (Richard) was born 12 June 1887 in Kalamazoo and passed away on 29 April 1913, at the age of 25 in Detroit. He was buried on 2 May 1913 at Riverside Cemetery. Geertruida, or Gertrude, was born on 3 September 1889. She died at age 13 on 29 July 1903. Or was she? She was buried on 23 July 1903 at Riverside Cemetery. Look carefully at the dates on the death certificate. What do you think about the date of death? Cause of death: Acute rheumatism with endocarditis. I have this photo of three of the DeSmit sisters. Note that the middle woman (in age) is clearly Cora who has a very distinctive look. Jennie was 1873 to 1908, married in 1905. Cora was 1880-1954, married in 1899. Frances was 1882-1980, first married in 1902. Gertrude was 1889-1903. I have posted this photo in the past, and I couldn’t decide the date of the photo and why there are three sisters instead of four. The truth is that if the photo was taken after Gertrude’s 1903 death, Frances would have been married and not the little girl she appears in this photo. So what if the photo was taken much earlier. What if the youngest in the photo was Frances and she was 14? Then Cora would be 16 and Jennie would be 23. Those are plausible ages for this photo, I think. That would date the image to about 1896, and Gertrude would have been 7 and not in the photo. Maybe Gertrude wasn’t in that photo because she as in another photo. What if the previous photo was meant to be the “young ladies” of the household, and this photo was meant to be the children? This would be about right to be Gertrude, Richard, and the youngest child Adrian (who I haven’t yet introduced). The date on the photograph is 1895 and WAS IDENTIFIED BY GRANDPA AS GERTRUDE, RICHARD, AND ADRIAN DESMIT! Because both Richard and Gertrude died so young, Adrian was the only remaining sibling of this photo throughout much of the 20th century. Lastly, Adriaan, or Adrian, was born on 9 December 1891 and baptized on 7 February 1892 in Kalamazoo. Adrian was a sailor with the U.S. Navy at the time of WWI and after. He enlisted 12 June 1918 and was released 30 September 1921. On 6 June 1923, he married Minnie Brondyk (born Groefsema) (1896-?). Minnie had been married to Jacob Brondyk and divorced him. I see Adrian had a daughter born years before his marriage, on 30 March 1917–Dorothy Marie DeSmit. So was he Dorothy’s stepfather or did he adopt her? Adrian died on 5 September 1988 in Gardena, Los Angeles County, at age 96. He was buried a week later, on 12 September, in Kalamazoo at Riverside Cemetery. To sum up: I only looked for certain documents: photos, death certificates, baptism records, and headstones. Graves for Jennie, John Sr.’s first wife–as well as the graves of the babies of Jacoba and John who passed away. If they were buried at Pioneer, this will not happen, most likely. There are many other records which can be search for, including records for spouses and children. Here is a special photo from around 1950 from Joel of my great-great-grandfather’s sister, Mary DeKorn, and the mother of all the children I’ve written about in this post. She lived to be 98 years old. And now for a super special photo from Joel. Five generations! From left to right: Mary DeKorn DeSmit, Donald Reeves, David Reeves, Edwin Reeves, and Frances Flipse. Mary DeKorn was John Sr.’s DIL, who was gone decades before this photo was taken around 1950. Frances Flipse was Mary’s daughter. Edwin was the son of Frances. Donald was the son of Edwin. And David was the oldest son of Donald. Joel, who gave me the photos, is the brother of David. Next time I will write about the other grandchildren of John DeSmit, Sr.
Two weeks ago I wrote about a pioneer of Kalamazoo, Michigan, John DeSmit, Sr., and last week I wrote more about his family. I mentioned that it appears that his first wife was Jennie (perhaps Van Sluis) and she was the mother of John’s oldest child, John Jr. Then he married Jacoba Lamper. But I really didn’t have too much information sorting out the wives. I know I said I would write about the next generation next, but before I do that, I want to clarify a little more about Jacoba and Jennie. Jacoba Lamper emigrated to the USA in 1855, together with her mother Christina de Bart and her brothers Marinus, Adriaan (Adrian) and Lauris (Louis). Her father died in 1840. Marinus was never married. Adrian married on May 31, 1860 at Kalamazoo to Hermania (Minnie) Reidsma (in the presence of a.o. Jan Smith). Louneres (Louis) married on September 9, 1858 at Kalamazoo to Gertrude Elizabeth VanEst (in the presence of a.o. Jan Smit). In the book “Emigranten naar Amerika……” all emigrants are listed in alphabetical order. So there’s no Jennie listed on the page of Jannis. Only Jannis is listed as emigrating. No wife and no four other couples are listed with Jannis, although his newspaper interview account states that five couples traveled together. Adri then did more painstaking work on this to try to locate Jennie’s emigration information by scanning an entire 200 page book. No luck. He also considered other first names. For instance, Jennie is a common nickname for Adriana in the Netherlands. Interesting that Jacoba married 7 August 1855. She must have married the minute she stepped off the boat! Also intriguing is her mother immigrating to the United States with her children, although her husband had been gone for fifteen years. It makes me wonder if there was some connection between the Lampers and either the DeSmits or another Kalamazoo family. Since Jacoba married so soon after arriving, I wonder if the wedding was planned ahead of time. Of course, John would have been eager to remarry with a baby to take care of. What I need to do is to try to get more information about the family from Holland, Erie County, New York. Or Long Island. Because therein lies a big problem. 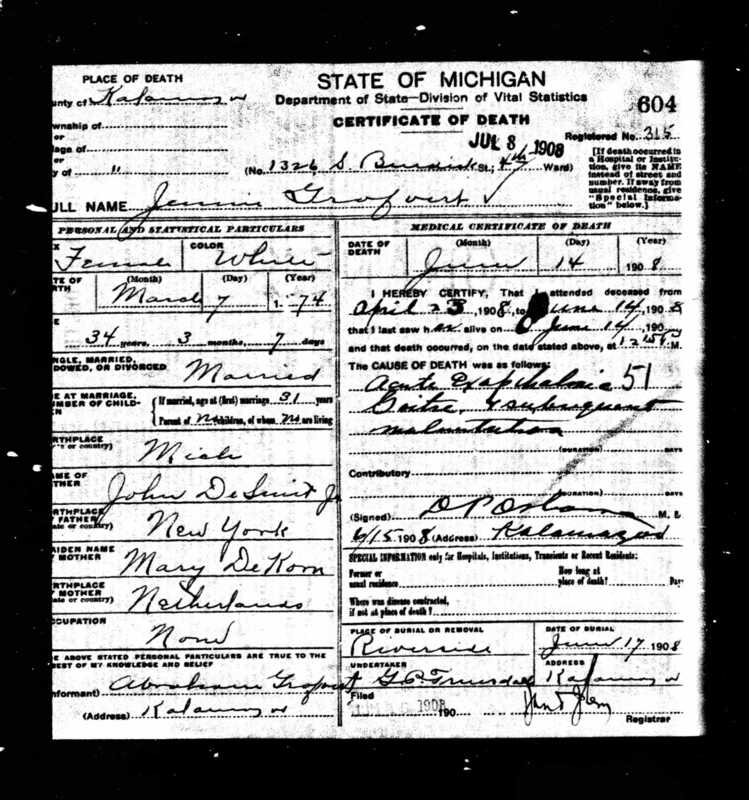 While Jannis/John talked about working on Long Island to the newspaper and his son’s death certificate says he was born there, there is another record, the marriage record of John DeSmit, Jr. and Mary DeKorn that indicates he was actually born in Holland, which is the far western part of New York State, about 400 miles from Long Island! Holland is 30 miles SE of Buffalo. Must be pretty cold there in the winter . . . .
Death Certificate of John DeSmit, Jr. The town of Holland was established in 1818 from part of the (now defunct) town of Willink, which once included all the southern part of Erie County. The name was derived from Willem Willink, one of the original investors of the Holland Land Company, which owned most of the land in western New York and sold it off to cities and townships that exist today. The name “Holland” is one of many surviving remnants of the Dutch investors who once owned this region. As with the town of Willink, the locations named after these investors have been given new names. Many of the original town buildings met their fate due to fire. Today the Holland Historical Society resides in the original fire hall on Main Street. In the 19th century, Long Island was still mainly rural and agricultural. Suburbanization started modestly on Long Island when reliable steam ferry service allowed prosperous Wall Streeters to get to new Brooklyn Heights homes in time for dinner. Rural traffic was served by the new Brooklyn and Jamaica Plank road through Jamaica Pass, among others. After the American Civil War, streetcar suburbs sprawled out onto the outwash plain of central and southern Kings County. Trolleys also brought workers from other parts of western Queens to Long Island City jobs. The Long Island Rail Road was begun as a combined ferry-rail route to Boston via Greenport. The predecessor to the Long Island Rail Road began service in 1836 from the ferry terminal (t o Manhattan) through Brooklyn to Jamaica in Queens, and completed the line to the east end of Long Island in 1844. Other rail lines to Coney Island, the Rockaways and Long Beach serviced the beach resort towns. The growing and merging railroads opened up more than 50 stations in (present-day) Nassau County and over 40 in Suffolk Country, laying the foundation for the future suburbanization of the island. From 1830 until 1930, population roughly doubled every twenty years, and several cities were incorporated, such as the City of Brooklyn in Kings County, and Long Island City in Queens. I am not used to researching the mid-19th century in the United States because most of my ancestors were not here that early. I’ve learned that birth records were not required before 1880 in New York State, so the hope of finding that record for John, Jr., died a swift death. That is no excuse for not finding his baptism in the Reformed records, though. It seems that everything that has to do with the DeSmits between arrival in the United States and John, Sr., marrying Jacoba Lamper is missing. Where is Jennie buried, for instance? Birth record and/or baptism of John, Jr.
Well, this brick wall isn’t even truly one of mine since Mary DeKorn married into the DeSmit family. I’ll continue my tangent, though, by writing about the next generation of DeSmits (I hope). I really was trying to imagine what Kalamazoo was like when John DeSmit, Sr. brought his family to the town. A population of 1,200. What were the streets and houses like? When I tried to research 1854, this is what I found: the Kalamazoo State Hospital (asylum) began being built in 1854! My own earliest relatives in Kalamazoo were the DeKorns–Mary DeKorn’s family. Her father, Boudewin, and mother, Johanna, arrived in the United States in 1855 or 56, right when Jacoba arrived and married John. The DeKorns, however, first settled in Zeeland, Michigan. Within a few years they moved to Kalamazoo with their three young children. Johanna was unfortunately gone by 1864 and Boudewin by 1873. They were my 3rd great-grandparents. Therefore, Boudewin and Johanna were the same generation as John and Jacoba DeSmit. John’s oldest child, John Jr., would marry Boudewin’s middle child, Mary. In my first post about the DeSmits there is a newspaper article about how John, Sr., worked on Bronson Park. Here is a great article with photos that show the history of Bronson Park. I requested photos of John and Jacoba’s headstones for their Findagrave memorials a couple of weeks ago, but no response yet. Speaking of Findagrave, the person who has my OWN FATHER’S memorial page has not responded to my two demands for management of it. We’ll see about that . . . .
UPDATE ON FINDAGRAVE: Findagrave responded to my request immediately and transferred my father’s memorial page to me. They were very accommodating even if the original site creator was not.